Paragons of Posture or Perpetuating Problematic Patterns? The title of this post is a small nod to my word-smithing grandfather and my English teacher mother. I do so love some good alliteration and I hope it has gotten your attention! What I really want to talk about is the issue of using a ballet dancer’s posture as the best model for how a singer should comport his or her body while singing. I’ve read many a comment on Facebook threads lauding a ballet dancer’s posture, in particular, first position, as an avenue to teach posture to singers. My short response is ‘that’s probably a bad idea’. I’ve written before about my issues with posture and the power of using a model of alignment based on bony markers instead. My issue with looking at ballet posture and extrapolating it to singing is this: singing and dancing are two different activities. The desired outcome of posture in ballet is appropriate for ballet and ballet only. 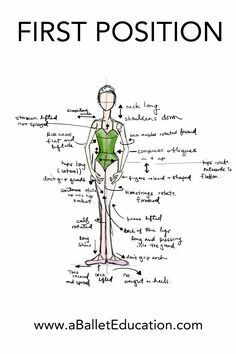 There are very clear rules about how to hold the body in ballet – each of the five fundamental ballet positions for arms and feet are practiced as a way of building a foundation to accomplish other ballet moves. As this image from aballeteducation.com shows us (click the link to see it larger), there are LOTS of things done to the body to achieve first position in ballet. AND lots of these things are contrary to finding a place of neutral alignment that allows for the greatest functionality in the body and voice. The places that I want to look to see if a postural position is going to help singing include: the feet, the legs, the pelvis, the core, the arms and the neck. So, assuming you are doing first position correctly, there is no weight in your heels, your feet are turned out to an extreme, kneecaps are engaged and lifted, ribcage is down (more on that in coming paragraphs), THE OBLIQUES ARE COMPRESSED, and the arm muscles are rotated forward. While those elements may lead to a fantastic first position, THEY DO NOT EQUAL ALIGNMENT. The feet as our foundation are off in this position. Of special note is that breathing for classical singing will be greatly compromised if the belly is ‘compressed’, which I’m assuming means engaged on a constant basis. About the ribcage…I like that the directive is to keep the flat and lifted – I’m not exactly sure what that means in ballet speak, but I assume from this article and the accompanying photo below, that ribcage thrust is not desired in first position, or the other positions in ballet. However, getting the arms overhead without the ribs moving to help, take a level of flexibility and mobility that many are missing. A quick search on google for images of ballet dancers turns up lots of pictures, like this one, of young girls who are beginning ballet and they stand with ribcage thrust. It isn’t hard to understand why. We are casted in the way we move from such a young age, that even at the age of 7 it can be challenging to stand without the ribs thrust, let alone raise our arms overhead without taking the ribs up too. While it may not be something you want in this pose, there is no doubt that rib thrust is a common part of many ballet positions – and rightly so if that is the desired posture on stage (just as it is in a ‘stick the landing’ posture for a gymnast). In fact, in my 15 years of teaching, every ballerina I’ve worked with has ribcage thrust (so do most other people, but it is a harder habit to break, I’ve found, in a ballerina) and seriously tight core musculature. Again, both of those elements are appropriate to the event at hand: ballet, but they don’t add up for singing as they don’t translate to functionality in the body and voice..
Ballet is a fantastically beautiful art form. I just want to call a separation between the correct postural position for a ballerina in any circumstance and how we want to stand and move for singing. Voice professionals will be far better served at educating themselves about what an aligned neutral state is in the body, understanding why so few bodies come to them presenting in neutral and how to begin to work with the body to return it to that place than they are to suggest simply standing in a ballet position and calling it appropriate. Will you love your body in 2017?